OUT OF STOCK...Girls monogram princess backpack. Setting off on a day outing with the family? Give the girls their own backpack that they can pack full of treats, toys and games to keep them busy. They will be delighted with the fun themed design that features beautiful princesses surrounded by magical horses, hearts and crowns in fashionable girly colors of pink and purple. 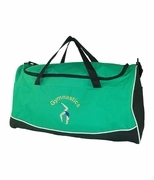 The bag offers a large main compartment with an extra front compartment, both easily opened and closed using zippers. Blue handles and matching blue trims complete the design. 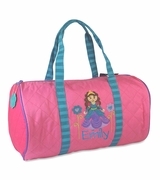 Add a matching lunch tote for a back to school set, search item SJ-8301-04.